The secret of our success is simple. Despite the precision of our processes or the refinement of our products, nothing affords us continual excellence without beginning first with great people. We are comprised of licensed and accredited experts in various market segments. Through this notable cohesion of professionals, our communication has awarded us a reputation for exemplary service and personal availability to our clients. As Founder and Chief Executive Officer of Jacob White Construction, Jeff Mickler has been delivering a product with outstanding service that no other contracting firm could convey since 1992. As a native Texan and true believer in the American Dream, Jeff’s passion for construction started at a young age while working with his hands to master the art of carpentry and design. He expanded that interest to build the foundation for what Jacob White has become today. In addition to serving on the board of numerous financial institutions and non-profits, Jeff has spent his professional career developing medical offices and corporate properties across the state of Texas, and building some of the largest green roofs in the country in an effort to create a cleaner, healthier working environment. A firm believer that every customer should truly feel like they are the only customer, Jeff has carried this mindset to Jacob White, ensuring that each construction experience leaves a positive impression beyond the life of the project. Jeff resides in Friendswood, Texas with his wife Holly, where he enjoys woodworking and the challenge and travel associated with private aviation. As President of Jacob White Construction, Sean Mickler has dedicated over ten years of his career growing his industry expertise as an Assistant Site Foreman, Superintendent, Project Manager, and Operating Officer. Holding a management degree from Purdue University, Sean’s passion resides in a long-time desire to be on-site watching both man and machine turn concepts into reality. Since the inception of his career, Sean has run some of Jacob White’s most complex projects including numerous mid-rise medical office buildings, surgical centers, marinas, and corporate aviation terminals throughout the United States. Sean is driven by the goal of ensuring that Jacob White and his team of construction professionals consistently delivers projects that exceed all client expectations. Sean holds a FAA Airline Transport Pilot Rating with Pilot in Command privileges on Cessna Citation series aircraft, as well as a Certified Flight Instructor rating, and resides in Friendswood, Texas with his wife, Katie. As Chief Financial Officer of Jacob White Construction, Sean A. Fitzgerald brings over 30 years of experience to the firm. A self-starter and problem-solver who is curious by nature, Sean graduated from Texas A&M University with his BBA, and Houston Baptist University with his MBA, and began his career working in public accounting as a small business consultant. He carried those skills into his first role as a CFO, and continues to apply that knowledge and experience to his current role. As a Certified Public Accountant (CPA), Chartered Global Management Accountant (CGMA), and Certified Valuation Analyst (CVA), Sean has transitioned teams on finance platforms, established and met consistent financial reporting deadlines, created budgeting and forecasting systems from scratch, and more. A member of Texas Society of Certified Public Accountants (TSCPA), the American Institute of Certified Public Accountants (AICPA), and the Financial Executives Networking Group (FENG), Sean enjoys identifying improvements to the status quo, and values Jacob White’s passion for excellence driven by a team that is dedicated to taking the company to the next level. When he’s not rolling up his sleeves to get to work, Sean can be found cheering for the Aggies with his family on Lake Conroe. 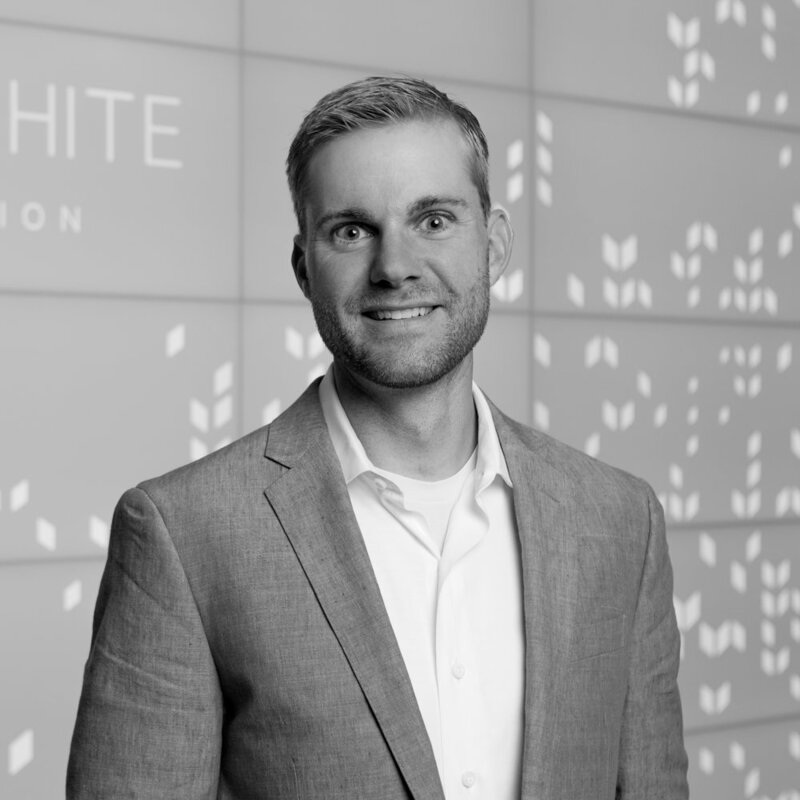 As Executive Vice President of Jacob White Construction, Christopher White brings 10 years of experience to the firm. A graduate of Rice University’s architecture program and a member of the Rice Design Alliance Program Committee and Rice Architecture Mentorship Program, Chris contributes a fine-tuned designer’s eye to each construction project. Chris is high-energy and results driven, and has the unique ability to walk in clients’ shoes throughout the course of each project in order to deliver success. An architect by trade, Chris has held titles including Project Manager, Vice President, Vice President of Business Development, and EVP in the healthcare, retail, and office industries. Each of these positions has prepared Chris to support Jacob White’s dedication to producing incredible design that transforms spaces to be their very best, ultimately changing the construction industry one job at a time. When he’s not crossing a project’s finish line with a happy client, Chris is running, playing tennis, and spending time outside with his wife and two kids. Shea Johnson brings over 20 years of business development, communication, marketing, and project management experience in both the private and public sectors to Jacob White Construction. Holding a BS in Business Administration from George Mason University, Shea is a 10-year Navy veteran and has dedicated years of his career to roles in the Pentagon, on Capitol Hill, and for the White House. In his current position as Vice President for Project Development, Shea applies his extensive experience with Business Development, Request for Proposal (RFP)/Statement of Qualifications (SOQ), and contract bid experience from identification, research, and review to delivering final products including Design-Build, Construction Manager-at Risk (CMAR) and Public-Private Partnership (P3) projects. Shea has managed the successful execution of projects for numerous federal and state agencies, Fortune 500 companies, and more. He is also responsible for contract awards in excess of $250M within the federal, state, and commercial sectors. In addition to providing expertise and insight during the construction phase of Jacob White’s projects, Shea oversees the development and implementation of all project management plans, project controls, and related procedures. He directs construction and systems management activities, manages program manpower and equipment resources, measures cost, schedule, and quality performance, and conducts project review meetings to evaluate the team’s achievements. When Shea isn’t on the job, he can be found brushing up on history and politics, trail running, and cheering for the University of Texas. As Senior Vice President of Operations, Gray brings 14 years of experience to Jacob White. With a Bachelor of Science from Texas A&M, his compassion and hardworking nature has inspired those around him to succeed in the healthcare, retail, and office industries. He’s held positions as Project Engineer, Field Engineer, APM, PM, and Sr. Preconstruction Manager through which he has had the opportunity to bring the latest technologies to people in need. OSHA 30 and CPR certified and a member of Associated General Contractors of America, Gray has the skill and experience to execute complex and challenging projects including the $26 million renovation of a warehouse into a sophisticated vivarium for cancer research. Gray finds joy in working with unique individuals to identify their strengths and ultimately using those strengths to help the larger team find growth and success. Jacob White boasts a dynamic, quick-thinking leadership group and environment that allows its staff to thrive. When not preparing conceptual budgets, detailed estimates, cost studies, value options, and practicing competitive bidding, Gray can be found going to the beach with his family, fishing, and spending as much time as possible with his kids. Teamwork is the ability to work together toward a common vision. The ability to direct individual accomplishments toward organizational objectives. It is the fuel that allows common people to attain uncommon results.